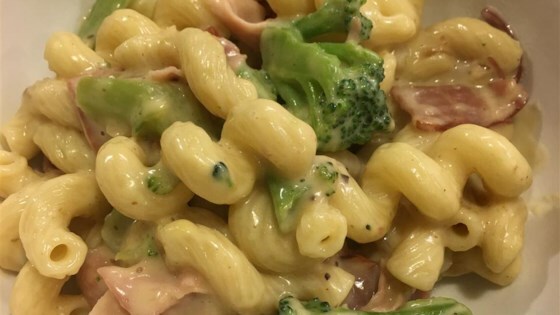 "This is a quick and easy ham and pasta dish cooked in a skillet." Bring a large pot of lightly salted water to a boil; add shell pasta and cook, stirring occasionally, until tender yet firm to the bite, about 9 minutes; drain. Combine broccoli florets, broccoli soup, milk, mushrooms with liquid, onion, mustard, salt, and pepper together in a large skillet; bring to a boil. Reduce heat to low and cook, stirring occasionally, until broccoli is tender, about 5 minutes. Stir pasta and ham into broccoli mixture and cook, stirring occasionally, until hot and bubbling, 5 to 7 minutes more. I made this recipes because I had some leftover ham. The only thing I changed was using cheddar cheese condensed soup instead of the broccoli cheese. The added mustard gave it a nice flavor. I did not add any extra salt because the broccoli cheese soup already has a lot in it -- and it was excellent. My husband and I really enjoyed it. good comfort food. followed the recipe except used cheddar cheese soup that I had on hand. good flavor! I wasn't sure what to expect, but it turned out delicious!